Hans Rosling wants to give us perspective. He uses facts and figures, graphs, and charts to show us why we’re wrong in our thinking about the world. Then he goes further. He explains why our natural instincts lead us to draw the wrong conclusions. He does all of this by carefully looking at the data. His methods win us over, but so does his personality and heart, because his observations are informed by a certain selflessness – the same motivation that led him to put in years as a medical doctor in parts of the world where the need for his services were most dire. This gives his observations gravitas and truthfulness. Rosling is out to eradicate the ignorance that is the special product of pre-conceived notions. His gift is evaluating data without looking at it through a frame of reference that distorts it. Sometimes the mistaken viewer’s frame of reference is outdated, sometimes it is just dead wrong and always has been. Seeing data for what it is may be one of the most valuable disciplines for a non-profit leader, especially the data that defines the focus and constituency of the organization. If there is one mandate for every non-profit, it is to remain the primary source of information for the focus it serves. This just cannot be done without the kind of perspective the author promotes. He finds pivotal data points which reverberate with meaning. For example, he shows us how infant mortality rate is a measure of the health and progress of a country because its decrease means so many other things are improving. He also brings the data alive in ways I have never seen before. To see what I mean, just look up one of his Ted Talks. These short reviews are meant to introduce the book and interest you in reading it. There is only enough space to go so deep. 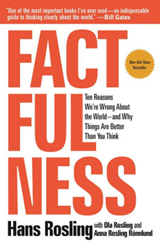 In this case, it might be instructive to just go through Rosling’s ten instincts that lead us astray in our thinking. The Gap Instinct. Of special interest at this time, when our talk seems so divided, this instinct (“humans beings have a strong dramatic instinct toward binary thinking”) which leads us to lazily divide the world into “us” and “them,” whatever the comparison, just does not hold, if it ever did. Most people, countries, etc. are in the middle. The Negativity Instinct. We tend to notice the bad more than the good. Media entities prey upon this instinct to sell newspapers and drive ratings at news stations. It distorts our view. The Straight-Line Instinct. That trends which may have been true in the past continue to be true at the same rate and will always be true long into the future. Rosling introduces the words “mega misconception” as it applies to population growth. The Fear Instinct. Evolutionary Psychology explains how the tendency to be fearful is a deep-seated human trait that helped keep us alive. Rosling distinguishes between things that are truly dangerous and those that are fearful but pose no, or little, risk. The Size Instinct. We tend to “get things out of proportion.” Here Rosling means that we gravitate toward judging the size of a problem based solely upon our own experience of it, while the facts may be very different. The Generalization Instinct. We tend to generalize, especially about groups and places we do not know. For this, the author prescribes travel. Get to know the world. If you can’t travel, cultivate an open mind. Also, beware of generalizing from the exceptional example. The Destiny Instinct. Again, the author calls up Evolutionary Psychology. For most of our existence the things around us did not change much, so it is natural to feel that places, people, and cultures have an ineluctable quality about them – they are one way and they will never change. The world is changing all around us and so is everything in it. The Single Perspective Instinct. “We find simple ideas very attractive.” There is no one solution to everything. Experts have their place in Rosling’s view, but experts become what they are by honing a deep, and often single understanding of complex challenges. If you are holding a hammer, everything looks like a nail. The Blame Instinct. This may be the instinct that distorts our view more than any other, because it shifts responsibility. Our tendency to point the finger at an individual or a certain group distorts the data. The Urgency Instinct. “The urgency instinct makes us want to take an immediate action in the face a perceived imminent danger.” The author goes on to tell us: “It’s almost never true,” and tells us a heart-wrenching story that turned him from being a doctor into a researcher. If you’ve read this far in the book, it will remind you that his observations and conclusions are not just intellectual exercises. He has lived them. I hope what I’ve shared about this book recommends it. I don’t think I have to spend another sentence explaining how it applies to any leadership role in any organization. Let’s take data security, for example. In my presentations to associations and other non-profits that include this topic, I always make the point that data security is more important for non-profits than commercial ventures because a non-profit’s entire existence is based upon winning and keeping the trust of its members and/or donors. If that trust is lost, so is everything else. The author is the son of Stephen R. Covey who wrote “The 7 Habits of Highly Effective People.” His father wrote the foreword to the book. The son makes the point in this book that trust has two components: character and competence. Character wins trust, and competence cements it. In a sense, this book takes an encyclopedic approach to what we mean by the word, trust. 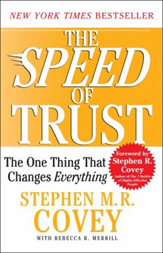 Covey articulates five waves of trust, all of which apply to the leadership of a non-profit, with special emphasis on the third wave – organizational trust.